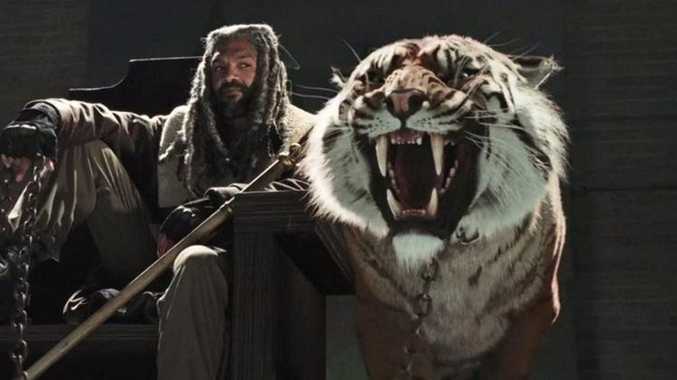 King Ezekiel with his pet tiger, Shiva. REVIEW: When The Walking Dead returned to our screens last week, I was left shocked and devastated by how the deaths of Glenn and Abraham played out. I was even left questioning whether I wanted to continue watching this show. So I guess in some way, it was a reprieve that the second episode of the season focussed on The Kingdom, and Morgan and Carol's reaction to it, rather than the no doubt devastating fallout the loss of two important characters is having in Alexandria. But in another way, this is the type of thing that frustrates me about this show. I'll admit that while I wanted to enjoy the quirky weirdness of The Kingdom, my head and heart was filled with Rick's group and what was going on in the aftermath of Glenn's death. Not to mention Maggie and whether she made it safely to Hilltop. It's no the first time the show has done this type of thing and it's a technique I resent. The last time they left us hanging, Glenn had supposedly died after being knocked off a dumpster by Nicholas. Then there was a wonderful episode involving Morgan that explained his newfound pacifist outlook on life. The trouble was, I don't know anyone who really enjoyed that episode, because all anyone wanted to know was whether or not Glenn had managed to survive. I don't think keeping people hanging in suspense, especially after they just waited six months for the Negan mystery to be solved, was really the way to go. This episode showed that The Kingdom are also under Negan's thrall, but their ruler, Ezekiel, has for the most part sheltered his people from that reality. Ezekiel and others in The Kingdom live in some kind of fantasy land where cobbler is consumed with every meal and acapella performances can breakout at any moment. Which brings me to the tiger. I know Shiva is part of the comics and adds to the absurd, eccentric interest of Ezekiel. It also helps that it is explained that he worked at the zoo and therefore had a relationship with the tiger pre-zombie apocalypse. But does having a real tiger strolling around help the credibility of the show at this point? I did enjoy the interactions between The Kingdom and our survivors, especially Ezekiel and Carol. Carol is doing that wonderful thing where she's pretending she's not the warrior we know she is and, in a scene that gave me immediate respect for him, Ezekiel saw straight through it, probably because he's no stranger to playing pretend himself. It led to one of the more interesting conversations I've seen on the show of late. My other favourite part of the episode was seeing people from The Kingdom fattening pigs with the flesh of walkers to get them ready for Negan in what was a superb passive-aggressive moment. After getting off to a grim start, I am hoping the series can find its way back to what it was originally able to deliver - great story-telling.